Municipal supplies, domestic users, industries, commercial businesses, livestock and power plants are among the users of Nebraska's water resources. None, however, use as much of Nebraska's water as farmers irrigating their crops. Reducing water use by center pivots is the goal of a joint effort by UNL and the state's irrigation industry. A new educational effort by UNL Extension seeks to inform center pivot irrigation operators on best practices aimed at reducing water consumption. In an unusual display of camaraderie, the major competing players in Nebraska's center pivot irrigation industry have joined forces to help in the effort. Valmont Irrigation of Valley, Reinke Manufacturing Co. of Deshler, T-L Irrigation Co. of Hastings and Lindsay Corp. of Lindsay will work with their dealers to hold educational sessions this winter for center pivot operators, said Ron Yoder, head of UNL's Department of Biological Systems Engineering and associate director for Agricultural Water Management. The Center Pivot Water Conservation Project arose out of a partnership between the companies, UNL Extension, the Nebraska Department of Natural Resources and the Nebraska Environmental Trust. "It's a strong partnership," said Yoder, who has helped coordinate the effort. The effort began two years ago when chief executive officers of the four companies met with Gov. Dave Heineman, who directed then-DNR Director Ann Bleed to explore ways for the companies to work together. The CEOs wanted to do what they could to help conserve water in Nebraska, Yoder said. Bob Meaney, senior vice president at Valmont, said it is unusual for the four competing companies to work together like this, but they looked past competition to help address the conservation issue. "It's one of the first times we've worked together," Meaney said. 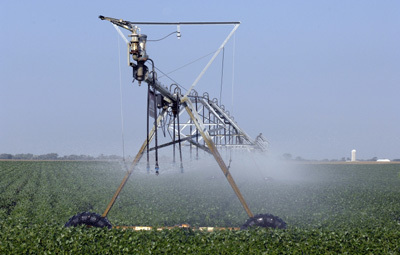 "The way center pivots are managed and maintained can affect water consumption. We were motivated by the need to conserve agricultural water in the state and concern about issues with the Platte and Republican rivers." Center pivot dealerships will hold informational seminars for their customers from late November through late February when irrigators are less busy, Yoder said. The sessions will be offered statewide but will target center pivot operators in the Republican River Valley in southern Nebraska and the Central Platte River area in central Nebraska. Irrigation is the biggest user of water in these areas, where the surface water has been deemed fully and over-appropriated, said Steve Gaul, supervisor of DNR's Planning and Assistance Division. The state must reach a "sustainable balance" of water users and supplies in these areas. This means that in fully appropriated areas any new consumption of water must be offset by a reduction in consumption elsewhere. In over-appropriated areas reductions in existing consumption will be needed. "What we would like to do is to find ways for irrigators to manage the water so they get more profit for every acre foot they pump," Gaul said. Many center pivot users need additional information on properly managing and maintaining their systems in ways that conserve water, Yoder said. "Evidence is pretty strong" that irrigators often use more water than crops need to produce the optimum yield, he said. The informational sessions will take place through group presentations and DVDs. Three levels of information will be presented. The first will be a basic introduction to the principles of applying water to soil. The second will cover how to take soil water and evapotranspiration measurements. The third will address center pivot technology such as controls and sensors and how to manage machines with automation. The Nebraska Environmental Trust is contributing $215,000 for the effort while the manufacturers are contributing $75,000 and the DNR $10,000. The money will pay for a project coordinator as well as program materials and marketing. The manufacturers and the university also are contributing additional services. The project coordinator is Chuck Burr, extension educator based in Holdrege, who said the education will be delivered by extension specialists and educators during winter customer appreciation events held by irrigation dealers. "We want irrigators to become more efficient in how they use rain and stored soil moisture," Burr said. "Pivots are pretty efficient in how they apply water, but I think we can be more efficient in how we use pivots to supplement what Mother Nature gives us." Higher fuel prices and land values and water shortages have changed the way operators must manage their units, said Derrel Martin, BSE irrigation and water resources engineer. "If we look at where we are today in irrigated agriculture there's been a huge paradigm shift," Martin said, citing the higher costs of operation in terms of money and natural resources. "We are trying to get people to think about these other factors."